This large map of Sligo by the prolific surveyor and roads engineer William Larkin, and compiled for the county grand jury, was started sometime in the early 1800s and was finally published in 1819. Pasted together, its six engraved sheets produce an image measuring around 1795mm by 1690mm, something a little under six feet wide by a little over five and a half feet high. Larkin thereby displayed the county in unprecedented detail. Published nearly two decades before the Ordnance Survey six-inches-to-one-mile maps, and appearing a generation before the great famine of the 1840s, Larkin’s map has a particular interest for local studies. Even though it was engraved and printed, this map never seems to have been widely available. The present version therefore makes its content more generally accessible by using modern imaging techniques to produce a high-definition version in atlas format. A commentary is also given, to set Larkin’s work within the broader contexts of the early nineteenth-century county and the history of Irish and Sligo maps. This book is the third to offer an analysis of William Larkin’s county mapping, earlier volumes having focused on his maps of Offaly (King’s County) and Meath. Although not without faults, these and other county maps reveal a wealth of information about early nineteenth-century Ireland. 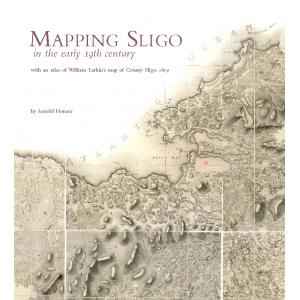 As well as aiming to make Larkin’s Sligo work better known, this book seeks to convey something of the richness that can be found in the early maps of an Irish county. Hopefully, it will be a stimulus to the many local historians and others who are curious about our environment and heritage.